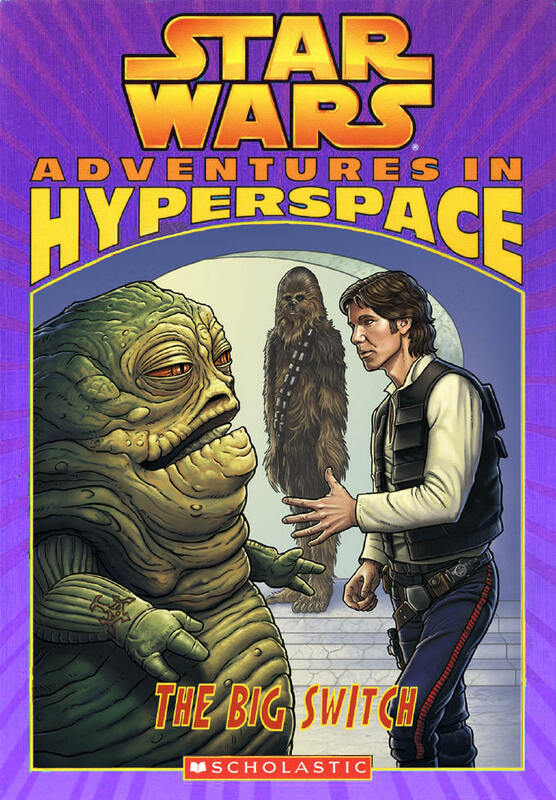 The Star Wars Expanded Universe Timeline is proud to present the never-before published third book in Scholastic's Adventures in Hyperspace series, The Big Switch, by Ryder Windham! Included are preliminary illustrations by Jeff Carlisle, footnotes and an afterword by Ryder Windham, explaining the history of this project, and a synopsis for what would have been Book 4: The Last Blade Master! No copyright infringement is intended or implied. 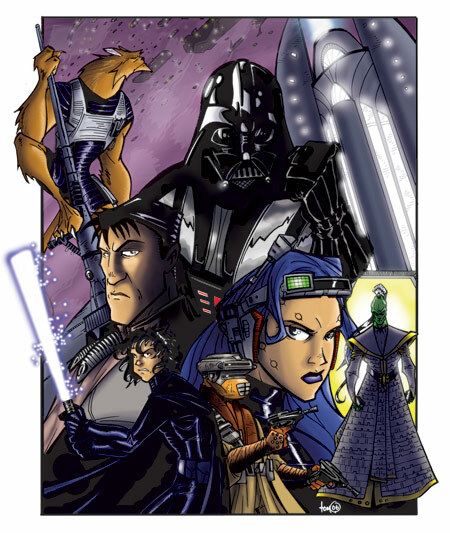 This is an unpublished work preserved here for fans and archival purposes; should Lucasfilm and Scholastic ever decide to publish it in the future, it will be taken down. Chewbacca the Wookiee looked at the stellar black hole and let out a whimpering groan. Chewbacca shook his furry head. 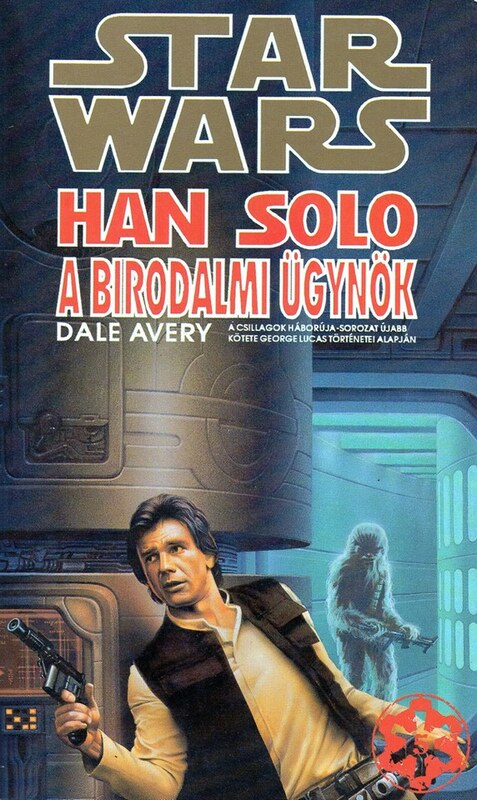 Seated beside Han in the Millennium Falcon’s cockpit, he found himself unable to tear his gaze from the dark, gravitational nightmare that loomed outside the cockpit’s transparisteel window. Han grinned as he confirmed the black hole’s coordinates on the navicomputer readout. “Chewie, I know you’re not crazy about the idea of using the  Ferra sector’s black hole for a gravity assist to the next hyperspace portal, but wait ’til you see how much time it will shave off our trip back to Tatooine.” Han gunned the sublight engines and veered toward the black hole. Chewbacca reached a massive hand to the hyperdrive controls. A moment later, the stars in front of the Falcon appeared to elongate and slide past the ship. As the Falcon accelerated to faster-than-light speed and zoomed into hyperspace, Chewbacca glanced at Han and barked a question. Chewbacca grunted in disagreement as he ran an in-flight systems check. According to the readouts, the Falcon was holding together despite Han’s reckless maneuver to save time. Although the Millennium Falcon looked like an old, battered YT-1300 Corellian freighter, Han Solo and Chewbacca had modified the engines, thrusters, and other systems to transform the ship into one of the fastest in the galaxy. Traveling through hyperspace, it did not take long for the Falcon to reach the Arkanis Sector, the region of space that was home to the sand planet Tatooine. Chewbacca answered with a happy bark. A moment later, the Falcon dropped out of hyperspace, arriving just outside Tatooine’s orbit. But then Chewbacca saw a bright blip appear on a sensor scope, and he let out an angry growl. The approaching ship was more than  five times longer than the Falcon. Although Tatooine was far from the center of the Galactic Empire, the Imperials kept a small  garrison in the spaceport city Mos Eisley, and they did stop ships from time to time. Han transmitted an affirmative signal while Chewbacca powered down the Falcon’s sublight engines. As the Customs corvette moved closer to their position, Han checked the Falcon’s automatic weapons systems. Thanks to his engineering skills, he trusted that the Imperial sensors would detect the Falcon’s weapons as “locked” even though they were really on full standby. Chewbacca replied with a concerned whimper. Leaving the Falcon’s cockpit, Chewbacca went to the main hold while Han stood in the passage tube and waited for the Imperials to enter through the starboard docking port. He did not have to wait long. “As you can see, we’re just hauling bottled water,” Han said as he gestured at the cargo crates stacked in the main hold. Chewbacca the Wookiee stood beside the crates and gazed uneasily at the stormtroopers as if he were afraid they might blast the bottles. “That’s a Hutt-owned establishment,” the officer said. Chewbacca let out a braying laugh and shook his massive head. Han and Chewbacca guided the Falcon down through Tatooine’s atmosphere. They flew over the Jundland Wastes and headed for Mos Eisley Spaceport, a sprawling cluster of domed buildings and open-roofed docking bays. As they steered past other airborne vessels, a warning light flashed on the systems console. Chewbacca glanced at the light and groaned. They descended into Docking Bay 94. Chewbacca deployed the Falcon’s landing gear and then the landing jets kicked in, sending a swirling cloud of dust up and around the ship as it touched down. The dust was still settling as Han and Chewbacca stepped out of the Falcon to see Jabba the Hutt’s men were waiting for them. Chewbacca stepped forward and roared in Bib’s face. 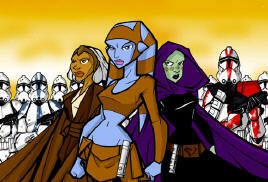 The Twi’lek cringed. Chewbacca smiled, baring his sharp teeth at the manager. “Right this way!” said the manager as he led Han and Chewbacca to a nearby table. He took their orders and fled to the kitchen. Han was interrupted by a loud gong. He looked to the restaurant’s entrance and saw Jabba the Hutt arriving with his gang. As Jabba’s heavily lidded eyes scanned the room, he saw Han and Chewbacca and smiled. “Very good, sir,” said the manager as Han followed Chewbacca out the door. Chewbacca sauntered off to Docking Bay 94 while Han went to  Bargoon Tatooni, a nearby trading post that offered a wide selection of used spaceship parts. On his way, Han saw a squad of stormtroopers. He wondered if Captain Rench’s corvette had returned to Mos Eisley. “Solo,” Kromer gasped. 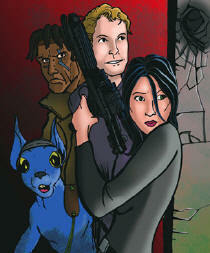 “I… You surprised me,” Lowering the hydrospanner, she tapped a control box on her tool belt and the alarm went silent. She looked around nervously. Han shrugged. “What did you expect me to do? 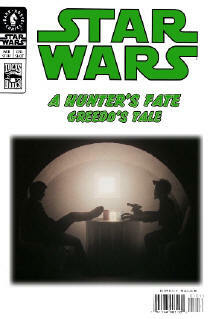 Shoot them?” Before Kromer could answer, Han brushed past her and entered the trading post. Kromer followed. “I’ve got some refurbished fulstar plates in the storage room,” Kromer replied. “You don’t have to tell me what you need,” Kromer said as she removed a square red plate from shelf. “I’m making them for Chalmun,”  Kromer said. “You’re a real sweetheart,” Han said as he paid Kromer. Chewbacca roared angrily from within the Millennium Falcon. Han had just returned to Docking Bay 94 and was halfway up the Falcon’s landing ramp when he heard his friend’s cry. Carrying the fulstar plate in his left hand, he boarded the ship fast, dropping the sack of Wookiee-ookies as his right hand drew his blaster from its holster. Han found Chewbacca standing in the port-side corridor. A small metallic object was in the Wookiee’s hand. Han helped Chewbacca removed the burned-out fulstar plate and install the new one. Minutes later, the Millennium Falcon’s engines fired and the freighter lifted up and out of the docking bay. Chewbacca glanced at a scope and spotted the incoming corvette. He snarled. 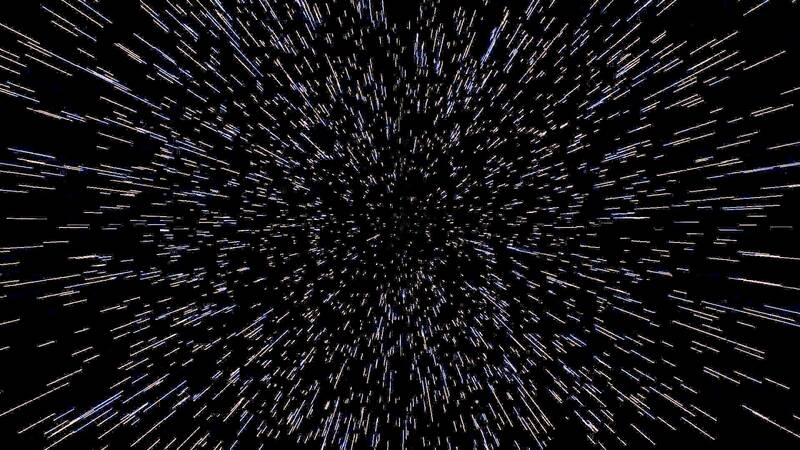 The Falcon hurtled through hyperspace by way of the  Triellus Trade Route and then detoured onto the Hollastin Run. Dropping out of hyperspace, the Falcon arrived in orbit of the planet Unagin. Although Unagin was in the Al'Nasrl sector, which was technically part of the Galactic Empire, the Falcon’s sensors did not detect any Imperial vessels in the area. After the datapad was linked in, the Falcon began her descent to Unagin. Using the coordinates from Jabba’s datapad, the Falcon traveled to a small spaceport and settlement near a wooded area in the planet’s southern hemisphere. Chewbacca surveyed a cluster of buildings at the edge of the settlement, then directed Han to land at a large compound of structures that were bordered by a durocrete wall. The Falcon touched down inside the compound, and three Aleena came running out from one of the structures to see the Corelleian freighter. Chewbacca brought Jabba’s datapad with him as he and Han stepped down the boarding ramp. Chewbacca switched off the hologram and Itto guided the Wookiee and Han to a nearby storage shelter. Itto was about to open its doors when a starship’s engines sounded suddenly from overhead. “You led an Imperial Customs ship to my home?” said the outraged Itto Bipsmik. “Not on purpose,” Han answered feebly as the Customs corvette descended fast and landed beside the Millennium Falcon in Itto’s compound. The Aleena children wrapped their arms around their mother as Captain Rench and a squad of stormtroopers emerged from the Customs corvette. “Nice to see you too, Captain Rench,” Han said with a grin. “I doubt we’d find anything of interest in your ship,” Rench said. “But I am curious about what we might find inside here.” He gestured to Itto’s storage shelter. While the three stormtroopers leveled their rifles at Itto and Chewbacca, the fourth trooper stepped toward storage shelter. Han stood very still, knowing if he reached for his blaster that the troopers would open fire. “Art, you say?” Rench said. “I call it a piece of trash.” He nodded to the stormtroopers. The troopers fired their blaster rifles, launching a trio of energy bolts at the ancient sculpture’s face. Itto shielded her children with her body as bits of stone exploded out of the storage shelter. When the dust settled, Han and Chewbacca saw that Great Bogga’s portrait was ruined. “Be glad that the Imperials busted Great Bogga and not us,” Han muttered. Itto nodded. “I used a laser  pantograph to cut it from a block of  anvilstone,” she admitted. “Only an expert could tell it is not the original. I was going to put it in my garden.” Behind her, the two Aleena children giggled as they ran in circles around Chewbacca. Chewbacca stepped away from the children and moved up beside Han to examine the replica. The Wookiee brushed one hand over the portrait’s clean upper lip, then barked a suggestion. Chewbacca walked with Han back to the Falcon. As they entered the main hold to begin their search for the hidden transmitter, Chewbacca’s black nose twitched. He looked down, saw a small sack lying on the floor near the engineering station, and then barked at Han. Ignoring Han, Chewbacca reached into the sack, pulled out a Wookiee-ookie and popped it into his mouth. He reached into the bag for another, but was surprised when he instead removed a thin rectangular card. He groaned as he held it out to Han. Chewbacca snarled as he accidentally crushed a Wookiee-ookie. “That’s the transmitter?” Han said. Chewbacca responded with a nod as he held up a wafer-thin metal strip that he had just removed from the fulstar plate. Han took the transmitter and placed it in the same pocket that held the Imperial homing beacon that Chewbacca had found earlier. Chewbacca emerged from the Falcon, then helped Han load the replica onto the Falcon. When they were done, Chewbacca left Han briefly to say goodbye to the Aleena family. Itto’s children were sad to see the Wookiee leave. “Prepare to be boarded, Solo,” Rench replied. “No thanks,” Han said. He steered away from the incoming corvette, and raced for the nearest hyperspace portal. The Falcon was still moving fast toward the portal when the entire freighter quaked and began to lose speed. “They’ve snared us in their tractor beam,” Han said as his hands flew across the controls. He brought the Falcon about in a rapid rotation until she faced the Customs corvette, then he increased energy to the deflector shields and hit the accelerator. Chewbacca yowled as the Falcon launched straight at the enemy vessel. Before the Imperial pilot could react, the Falcon reversed field in the tractor beam and dived under the Customs corvette. Han used the combination of the tractor beam’s draw and the Falcon’s thrust to break free of the beam. “You’ll have to catch me first,” Han replied. The Customs corvette’s laser cannons opened fire, launching a hail of green laser bolts at the fleeing freighter. 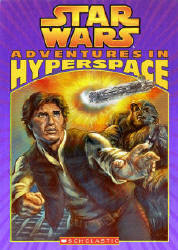 Han swerved to avoid the barrage of laserfire and raced back to the hyperspace portal. Three red energy bolts slammed into the Falcon’s shields, but the shields held. Before the Customs corvette could fire again, the Falcon vanished into hyperspace. Rench bellowed, “I’ll get you if it’s the last thing I ever—” And then his transmission ended. From a safe distance, Han and Chewbacca watched as the escape pod and Customs corvette vanished into the black hole. Turning to face Han, Chewbacca woofed a question. Han replied, “No, Chewie. I didn’t enjoy watching that happen. Escape pods cost money, and now we’ll have to get a new one! “And I don’t like running into trouble,” Han said. “But it happens sometimes.” Han and Chewbacca stood beside a repulsorlift gravsled at the bottom of the Millennium Falcon’s boarding ramp. On the gravsled, a cloth tarpaulin was draped over a large object. “See for yourself,” Han said as Chewbacca yanked the tarp away to reveal the object on the gravsled. “Yes, mighty Jabba,” Bib said. He ran off. Chewbacca watched Jabba wriggle his bulky form closer to the sculpture. Although Chewbacca was not afraid of Jabba, he was concerned about how the Hutt would react if he discovered the sculpture was a replica. Han did his best to look bored but he was anxious too. He let his right hand dangle near his blaster, just in case things went bad. Chewbacca whimpered. Han brushed his fingers against his pistol’s grip. Chewbacca let out a silent sigh of relief. Han shifted his hand away from his blaster. They secured the Falcon and were halfway to the trading post when they saw Kromer approaching on the street. She cried, “Han! Chewie! I saw the Falcon land, but then I saw Jabba and his men, and I waited until they left, and…” Her lower lip trembled, and she threw herself at Han and embraced him. 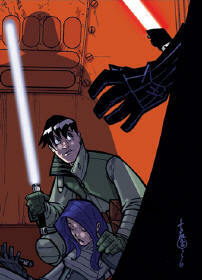 Kromer pushed herself away from Han, glared at him, and then turned and stormed off, heading back to the trading post. She did not look back. 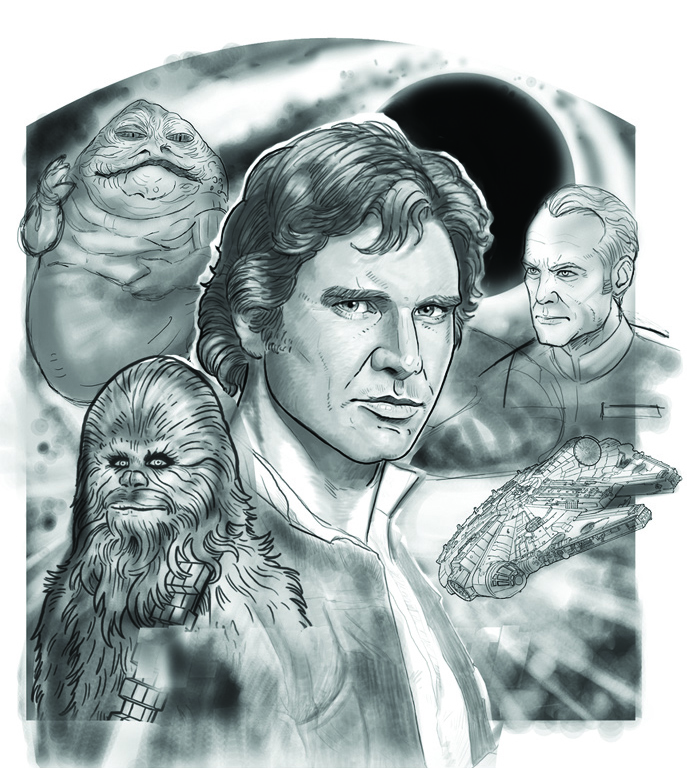 After learning that Scholastic was hoping to publish a series of illustrated Star Wars books for young readers, I proposed a series featuring Han Solo and Chewbacca before the events of A New Hope. At my suggestion, artist Bill Hughes drew a few try-out sketches for the new series, but Scholastic hired artist Robert Rath. 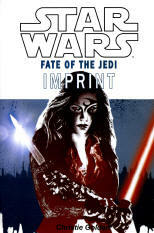 I was initially contracted to write four books, and Lucasfilm approved my synopses for all four stories. 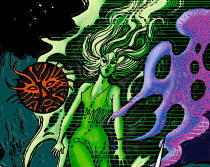 I was working on the third manuscript when my Scholastic editor, Annmarie Nye, informed me that artist Jeff Carlisle, who'd also produced try-out art, would illustrate the two remaining books. Shortly after completing the third manuscript, which was titled The Big Switch, Annmarie told me that Scholastic had decided to cancel publication of the third and fourth books because of low advance orders on the first two books. The Big Switch features a character named Kromer. I did that in tribute to Star Wars fan Kayla Kromer, who achieved international nerd fame for her fantastic home-made Millennium Falcon bed. I also liked the name 'Kromer,' thought it sounded good for a mechanic in Mos Eisley. 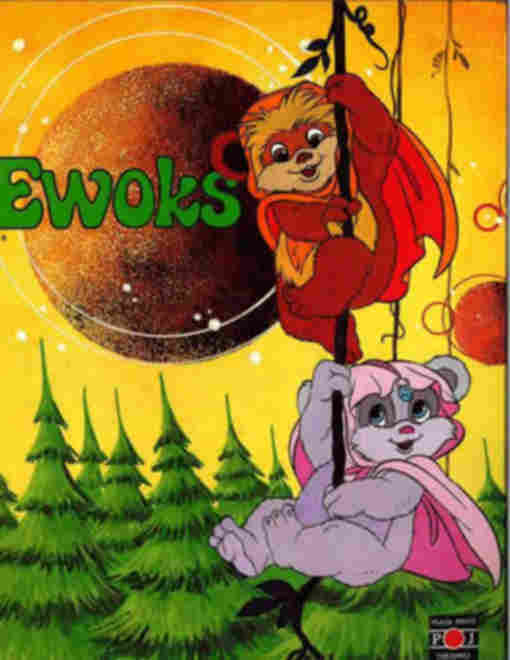 I went so far as to get permission from Kayla to let us use her likeness for the character, which Lucasfilm approved too, but then the book was cancelled. Such is life. Han and Chewie are transporting an antique business droid, CZ-4—a gift from Boonda the Hutt to Jabba—when their hyperdrive malfunctions. They are forced to land the Falcon on a world inhabited by the Numm, humanoid aliens with primitive technology. The Numm are unable to provide the parts needed to repair the Falcon’s hyperdrive. Rotten luck! The Numm become nervous at the sight of CZ-4, apparently because they are fearful of droids. While Han and Chewie consider their next move, CZ-4 goes missing. This is bad news because the droid is Boonda’s gift to Jabba. If they ever hope to do business with the Hutts again, they must recover the droid. 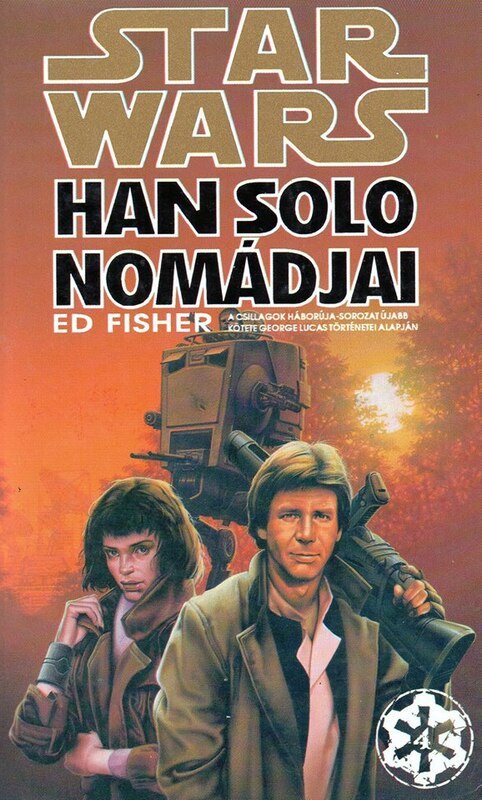 At first, Han and Chewie suspect that the Numm are responsible for taking the droid, but they soon discover that this moon has another population: a group of war droids who have been terrorizing the Numm ever since their ship crashed centuries ago. The war droids once fought on behalf of the Krath, a long-forgotten secret society that once menaced the galaxy. 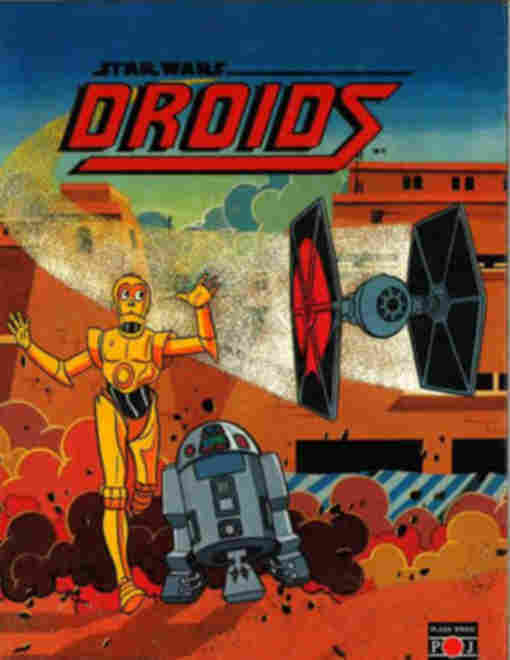 It is the war droids who have abducted CZ-4. The war droids’ leader is known as the Blade Master (his arms house retractable metal swords), and he wants to cannibalize CZ-4 for parts. Chewbacca winds up competing against the Blade Master while Han rescues CZ-4 from disassembly. Chewie defeats the Blade Master. Han not only rescues CZ-4, but deactivates the other droids. CZ-4 and Chewie figure out a way to quickly reprogram the remaining Krath droids to aid the Numm. The no-longer-threatened Numm are grateful to Han and Chewie, and lead them to the ruins of a crashed freighter (maybe the one that delivered the war droids to the planet). Chewie is able to salvage parts from the freighter’s wreckage, and uses these parts to repair the Falcon. Taking CZ-4, Han and Chewie are now able to continue on to Tatooine, where they deliver the droid to Jabba. Jabba tells them he has another job lined up for them. 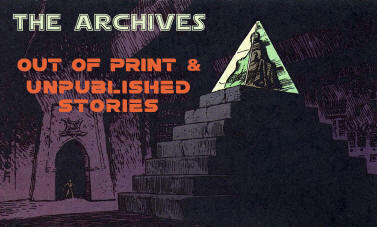 Notes: Boonda the Hutt has appeared in Droids comics and other stories. CZ droids and Krath war droids are drawn from the EU, and were included in The Essential Guide to Droids. The Numm and their moon are my invention. 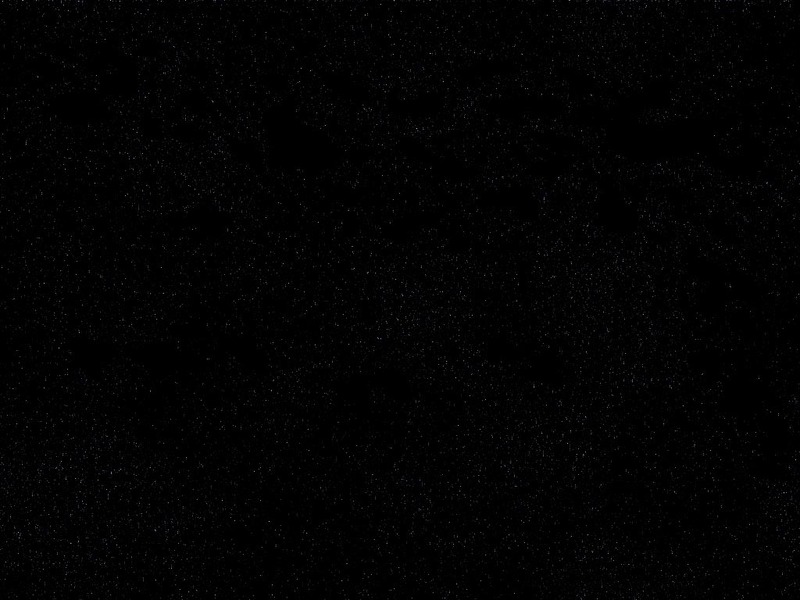 [R1]FYI, this info is basically scientifically accurate, that a heavily-shielded spacecraft could be 160km (100 miles) away from a black hole without getting sucked into it. It’s when you get within 50 miles of the event horizon that you’re a goner. [R2]The Ferra sector is in the Outer Rim, near the Arkanis sector. It is my invention that there is a stellar black hole in the Ferra sector, but I don’t believe this violates any continuity. I selected the Ferra sector for its location between Hutt Space and Tatooine, as those two locations also figure into the story, and I want to keep fans of the Essential Atlas happy too. [R3]Info about this vessel being used by Imperial Customs is consistent with SW: Galaxy Guide 6: Tramp Freighters. [R5]Info re. 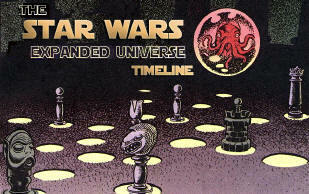 Imperial garrison on Tatooine is consistent with various published books. [R6]This line is consistent with the “general override broadcast” mentioned in Brian Daley’s Han Solo’s Revenge, page 355 of the TPB edition that collects all three Solo novels. 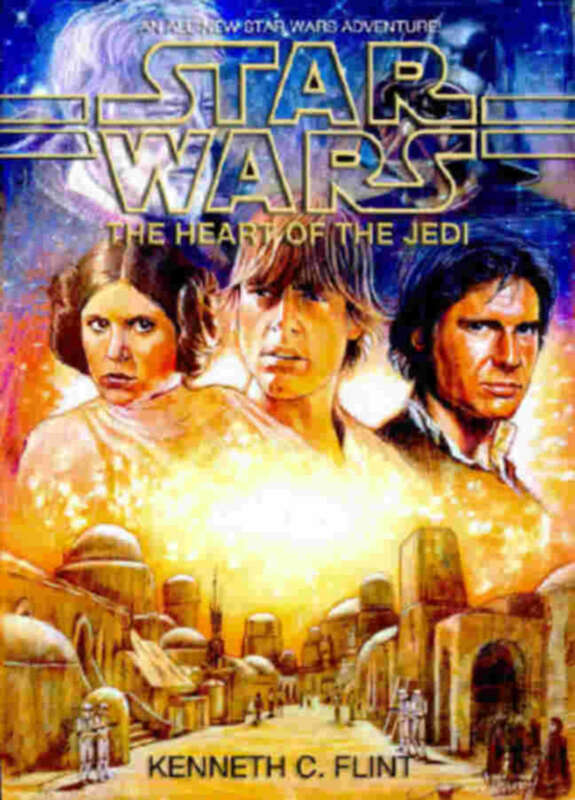 [R7]According to SW: Complete Locations, page 132, Court of the Fountain is a “Hutt-owned exotic restaurant” in Mos Eisley. [R8]The Imperial Anti-Raceteering Act is my invention. [R9]The fulstar plate is a hyperdrive component that was mentioned in Star Wars: Adventures in Colors and Shapes (Buena Vista Records, 1984). According to that book/record, the Millennium Falcon used square red fulstar plates. [R10]Unagin is an established location. 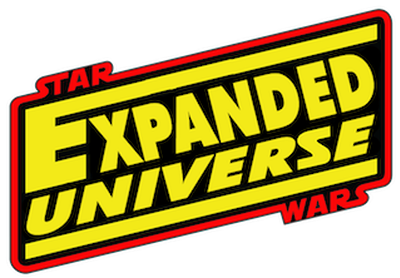 According to Star Wars: The Essential Atlas, Unagin is a minor trade world, a common stop for ships coming to and from Hutt Space. [R11]It’s consistent with published reference that some datapads are equipped with holoprojectors. The New Essential Guide to Weapons and Technology, page 179, shows one such datapad. 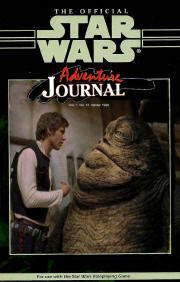 [R12]Jabba’s ancestor Great Bogga is an established character who appeared in the Tales of the Jedi comics. [R14]Kromer is a new character, a young woman. The character is named after Kayla Kromer, who fabricated the Millennium Falcon bed that became famous by way of the Star Wars website. I believe Ms. Kromer will appreciate this tribute. [R15]The references to the colors and shapes of the fulstar plates draws from info in Star Wars: Adventures in Colors and Shapes (Buena Vista Records, 1984). [R16]Wookiee-ookies were introduced in the “Star Wars Holiday Special.” Chewbacca likes to eat them. [R17]Kromer’s namesake, Kayla Kromer, popped up again on the Star Wars website after she posted photos of Star Wars-themed cookies that she made. 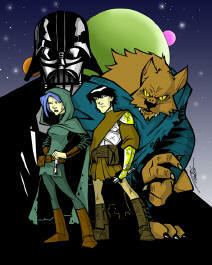 Again, a fun tribute, but trust that the Wookiee-ookies are actually significant to this story. [R18]Chalmun is consistent with published reference. [R19]Navigational info is consistent with The Essential Atlas, pages28-29. Kind of nerdy, but I think some readers will get a kick out of it. [R20]Kloo horn is a wind instrutment in the SW universe. 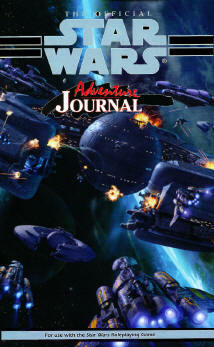 [R21]According to SW: The Essential Atlas, the planet Near Pando (located in Hutt Space) has mysterious ruins. [R22]This is a Hutt expletive, introduced in one of the Jabba comics, The Hunger of Princess Nampi, scripted by Jim Woodring, who was making an in-joke that only cartoonists would get. The word “farkles” was originally coined by cartoonist Mort Walker (creator of Beetle Bailey), who defined it as “intensely concentrated spots of reflected light” in his own humorous lexicon for comic strip art. [R23]The “laser pantograph” is my invention, but sounds like a plausible device. I think readers will grasp that a “pantograph” is a tool used to make reproductions. [R24]According to Wookieepedia, anvilstone was a type of very hard stone mentioned in the novel Outbound Flight. [R25]In this sequence, Han uses a dangerous maneuver to escape a tractor beam. I did not invent this maneuver, but appropriated it directly from Brian Daley’s Han Solo’s Revenge. 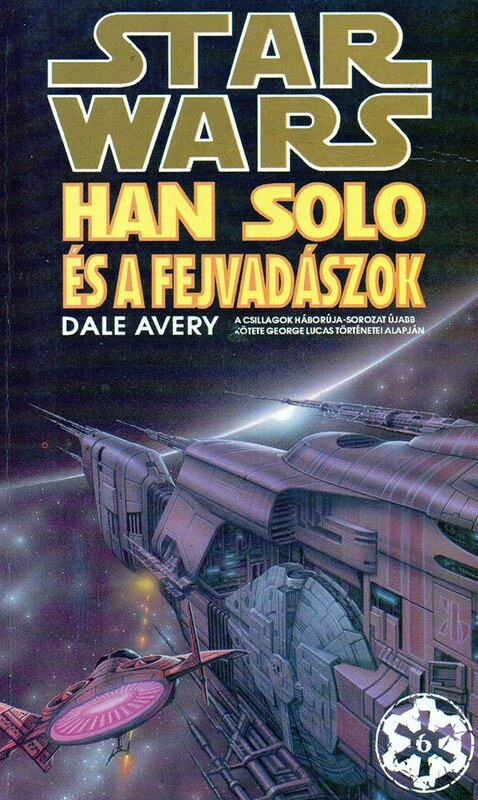 In the collected edition of The Han Solo Adventures, you can find the maneuver described on page 352. [R26]Klatooine paddy frogs are a favorite food of the Hutts according to various published references.